The 52-year-old conflict between the Colombian government and the Revolutionary Armed Forces of Colombia, aka the FARC, is the country’s most long-standing insurgency. But the peace talks to end that conflict are hardly the first time the Colombian government has met face to face with guerrillas. For decades, presidents and administrations have sat down with a myriad of illegal armed groups, lessons from past meetings often loom large at the Havana negotiating tables. Here is a roundup of Colombia’s biggest illegal organizations beyond the FARC and the history of negotiations, as well as outcomes. As peace talks with the FARC advance slowly but surely, the government is simultaneously broaching talks with the country’s second-largest armed group, the National Liberation Army (ELN). But the ELN’s kidnapping of three journalists in late May put the entire process—as well as the FARC’s—in jeopardy. The group released the journalists within a week, but dealings remain thorny. The ELN numbered about 2,500 members as of March 2016. It was founded as a Marxist-Leninist guerrilla in 1964 by a group of students invited to Cuba by the Castro government to receive education and military training in order to “export” the revolution. At least 20 Colombian and 10 Spanish priests who followed a Marxist version of liberation theology also joined its ranks. Early on, the group remained a small organization financed via kidnappings and extortions. In 1973, the Colombian army reduced its numbers from 250 to 70 men through a military operation known as “Operation Anorí.” But in the 1980s, the group moved on to seizing the profits of illegal mining and extorting oil companies. At that point, its numbers swelled, peaking at 4,000 members in 2000. The group also developed a complicated relationship with drug dealing. The ELN officially opposes using drug trafficking as a means to achieve its political goals, but its members have struck deals with narcos to protect mutual interests, and more recently the guerrilleros have been found to protect coca crops. Currently, the ELN is present in oil-rich areas of the country, in the northeast near the Venezuelan border and near the Magdalena River basin in central Colombia. The group is also present in the Pacific coast region, particularly in areas with heavy illegal mining activity. The ELN has participated unsuccessfully in three peace talks with the Colombian government. The first was in 1992, when the group joined the FARC and a remnant dissident faction of the Popular Liberation Army (EPL) in Tlaxcala, Mexico. However, the EPL kidnapped a former minister who later died in captivity, resulting in the breakdown of negotiations. The ELN sat down again with the government for a few years beginning in 1998. But the rebels then staged mass kidnappings and even hijacked an Avianca plane as a way to pressure the government into accepting their terms of negotiation. In June 2002, then-President Andrés Pastrana decided to abandon the peace talks. Finally, the government of President Álvaro Uribe held peace talks with the ELN between 2002 and 2008, with the mediation of then-Venezuelan President Hugo Chávez. Uribe proposed to pay the guerrillas to stop kidnapping, but the two sides failed to reach an agreement. The EPL was founded in 1967 and followed a Maoist ideology. The group originally operated in the northwest Urabá region near the Panama border, where they focused on fighting and extorting multinational corporations, in particular banana-growing ones. The group had 4,000 members at its peak in 1990 when its leaders signed a peace agreement with the government to disarm and demobilize. According to the agreement, the EPL could send two non-voting members to the Constituent Assembly the following year and the group would be legally allowed to become a political party. However, not everyone in the organization agreed with becoming a political party and many in the group remained active rebels after that. Those who demobilized started a new party called Hope, Peace, and Liberty (also EPL by its Spanish initials) in Urabá, but most of their leaders were murdered by the EPL faction that refused to disarm and FARC rebels who considered the disarmed EPL members traitors. Since the failed three-way negotiations with ELN and FARC in 1992, the Colombian government has considered the EPL a criminal organization rather than a political movement and says it will no longer negotiate with them. Starting in the 1980s, many members of the EPL deserted the organization and became paramilitary leaders, prominent narco barons, or both. One example is Los Rastrojos, founded by the Úsuga clan, which became the largest neo-paramilitary group in the country. Those who remained in the EPL after the 1990 peace deal also forged pacts with paramilitaries and maintained involvement in drug trafficking. More recently, the only visible leader of the EPL was Víctor Ramón Navarro, aka “Megateo,” and the size of the group’s membership is unclear. In October 2015, the Colombian Army confirmed it had killed Megateo a few months earlier. 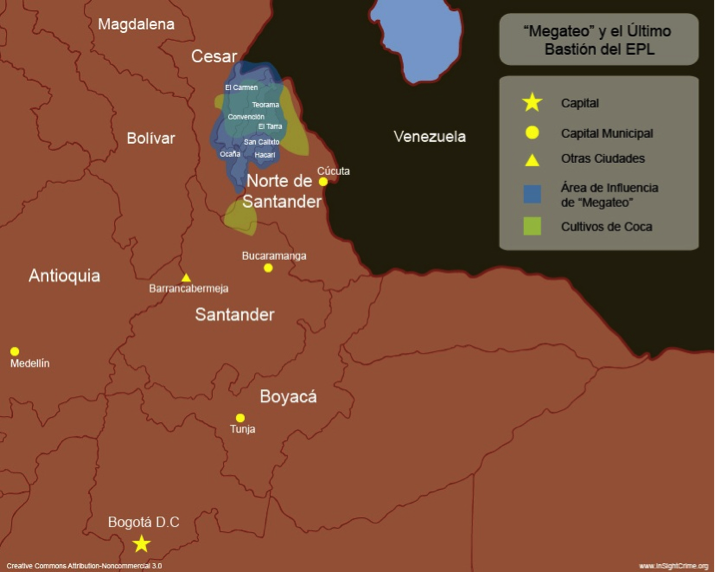 The EPL’s area of influence is concentrated in a region known as El Catatumbo in Norte de Santander near the border with Venezuela—a hotbed for cocaine production. The United Self-Defense Forces of Colombia, known as the AUC, was the largest right-wing paramilitary group in the country until its 2006 disarmament. The group formed in April 1997 when various paramilitary leaders from around the country decided to unite under the leadership of Carlos Castaño and fight leftist guerrilla groups for control of drug and contraband routes. By 2004, the AUC operated in 35 percent of the country and its membership reached 13,500 members. The AUC also used violent intimidation to influence elections; it is thought to have controlled about a third of the Colombian Congress elected in 2002. The AUC committed massacres, assassinated political leaders, and displaced peasants to occupy and exploit their land. An estimated 420,000 people can claim to be AUC victims, according to the Public Prosecutor’s Office. But, as of 2015, the Colombian legal system had only recognized 3,136. On July 15, 2003, the AUC signed a peace agreement with the Uribe administration in Santa Fe de Ralito, which began the demobilization of the entire organization. AUC members were required to confess all of their crimes and turn over assets to contribute to reparation of victims. In exchange, they would receive short prison sentences in Colombia ranging between five and eight years. But, after the three-year demobilization process ended, 31,000 AUC members had demobilized, leading some political figures, including Pastrana, to claim that drug traffickers had pretended to be paramilitary members in order to get in on demobilization benefits and avoid extradition. During the peace talks, Uribe denied an extradition petition from the United States requiring 14 AUC bosses to face drug smuggling charges. However, in 2008, the Uribe government decreed that these paramilitary heads had not complied with the peace agreement, and opted to follow through with the extradition. The April 19 Movement (M-19) was an urban guerrilla group that existed between 1974 and 1990. The group formed out of frustration with the 1970 presidential election (held on April 19) and claims of voter fraud. Unlike the other typically rural, guerrilla groups in Colombia, M-19 mostly operated in cities and it attracted university students from across the country, presented itself as an armed intellectual protest against the Colombian government. In 1985 the group had about 2,500 members. On November 6 of that year, 28 members used rifles to take over the headquarters of Colombia’s Palace of Justice in downtown Bogotá with the purpose of staging a trial against then-President Belisario Betancur. The government responded by sending police and Army tanks in a 27-hour-long battle. The fighting left 100 people—including 11 judges— dead and 12 people disappeared. In 1989, M-19 members reached a deal with the government and agreed to disarm. In 1990, the M-19 became the first armed group to sign a peace accord in Colombia. It then agreed to become a political party. Eventually, a constituent assembly was approved, thanks to the support of an independent student movement during the 1990s presidential elections, and that of leading leftist politicians. The Democratic Alliance-M-19 (AD/M-19), the new party created by M-19 members, appointed Antonio Navarro Wolff as one of the assembly’s three presidents. About 7,000 M-19 members demobilized, but at least 600 of them, including the presidential candidate Carlos Pizarro Leongómez, were murdered in the 1990s. This is one of FARC’s main concerns after their eventual demobilization, which is why the government has offered certain security measures for them. On the other hand, some of the demobilized M-19 members ended up having successful political careers. For example, Gustavo Petro served as a senator and the mayor of Bogotá, while Wolff was mayor of Pasto and governor of Nariño. As of spring 2016, the FARC, the ELN, the EPL, and an assortment of neo-paramilitary bands known until recently as Bacrim are all active in Colombia. Since May 5, the Bacrim have been officially reclassified as “Organized Armed Groups,” or GAO, by the government.